DIABLO™ PROTEIN is a delicious lean protein supplement that also offers the benefits of natural stimulant-free weight management. The combination of concentrated whey, milk and micellar casein proteins offers a satiating and sustained release of protein that can fend of hunger, and help support daily protein goals. 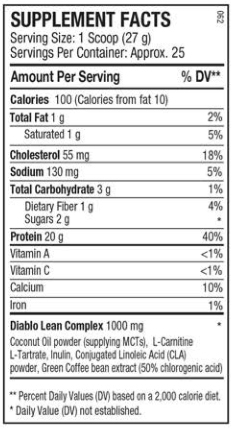 With low sugar and low fat content and only 100 calories per serving, Diablo™ Protein makes the perfect snack alternative or post-workout shake that fits within your dietary needs and goals. 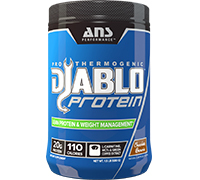 DIABLO™ PROTEIN also includes a fat burning combination of natural weight management support agents: Coconut Oil (MCTs), L-Carnitine L-Tartrate, CLA, Inulin (prebiotic fiber) and Green Coffee Bean extract. Each of these helps with different aspects of metabolism support to provide stimulant-free and safe weight management benefit that makes Diablo™ Protein unique and like no other protein on the market.